ACCEPTING ART SUBMISSIONS UNTIL NOVEMBER 25th! 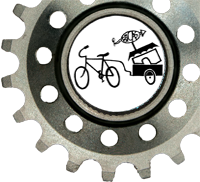 BICAS is seeking bicycle-inspired art and work created from bike parts, for the 22nd annual BICAS Art Auction! All mediums accepted. Artists are welcome to use scrap parts from BICAS. This is a great opportunity for artists to show off their art while donating to a good cause; over 1200 people come to our 2-night event. Please bring art ready to install. Please include any special hanging hardware and instructions. Artwork should be securely tagged with Artist Name, Title and Medium attached to back of art. Tuesday - Sunday 11am-6pm. Closed Mondays. 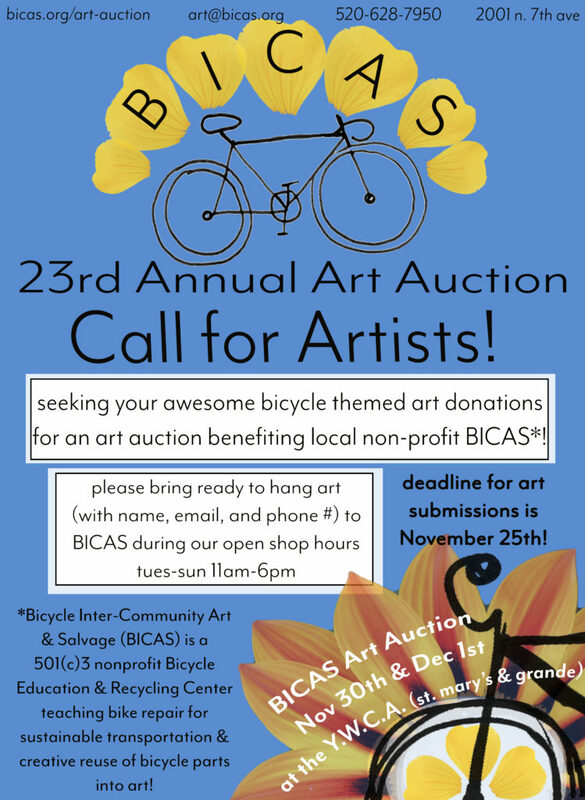 The Annual BICAS Art Auction is a 2-day silent auction that is anything but quiet. Enjoy bands, DJs, beverages, and our Kid's Craft Courner while bidding on unique one-of-a-kind artistic creations celebrating everything bicycle. Take home a BICAS t-shirt, hat, pint glass or some "buy-it-now" creations from our Jewlery Boutique. All proceeds from the fundraiser support BICAS programs in the Tucson community. Bidding ends at 9 PM sharp on December 1st. Highest bid wins. ​Please join us on November 30th and December 1st. The Art Auction will be located at The YWCA 525 N Bonita Ave. Bicycle art, music, and family fun. If you are submitting multiple artworks with the same title and description, please enter the quantity number here. Please fill out the following form for each individual art donation to the BICAS Art Auction. Thank you for your contributing your work to support our annual fundraiser! We hope to celebrate with you at this year's Art Auction in December. BICAS is open Tuesday-Sunday 11-6pm. Please have each piece labeled with the Artist Name and Title of Piece. Let BICAS staff at the front counter know you have an art donation for the Art Auction and that you have filled out the online form. Thank you! Please enter the Artist(s) name(s) as you would like it to appear next to the art. Please give us a detailed description of the artwork. Optional: the Artist's estimate for the retail value of their work. Staff use only.